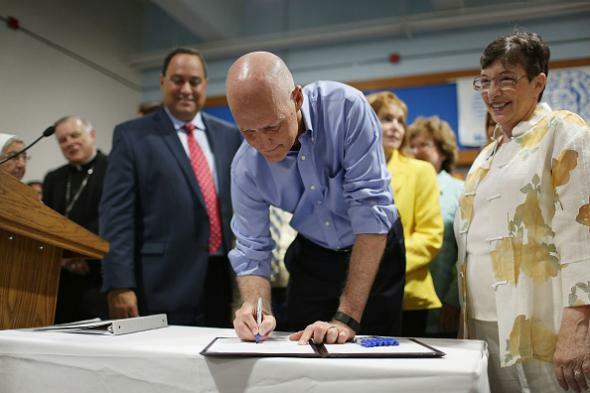 Florida death penalty reformed after Supreme Court ruling. Florida Gov. Rick Scott on July 13, 2015, in Miami Gardens, Florida. Florida has passed a law overhauling the state’s death penalty system to address problems identified by the Supreme Court in a Jan. 12 ruling that halted executions in the state; it remains to be seen whether nearly 400 individuals sentenced to death before the new law will still face capital punishment without resentencing. SCOTUS ruled the state system in which judges, rather than juries, imposed death sentences unconstitutional with an 8–1 ruling in Hurst v. Florida. The [Hurst] ruling, however, did not immediately spare the life of Timothy Lee Hurst of Pensacola for murdering a co-worker at a fast-food restaurant more than seventeen years ago. The Court sent back to state courts the question whether the flaw in the sentencing procedure was a “harmless error” — that is, whether Hurst would have been sentenced to death even if Florida had left the decision solely to the jury. Florida has executed more prisoners in the past five years than any state except Texas.